WASHINGTON, D.C. -- Americans' satisfaction with the way the healthcare system works for them varies by the type of insurance they have. 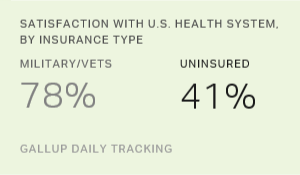 Satisfaction is highest among those with veterans or military health insurance, Medicare and Medicaid, and is lower among those with employer-paid and self-paid insurance. 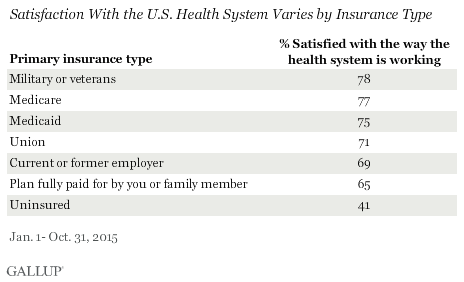 Americans with no health insurance are least satisfied of all. In 2015 to date, 67% of Americans are satisfied, compared with 66% in November 2014. Gallup began tracking Americans' satisfaction with the healthcare system in March 2014, at the end of the first Affordable Care Act (ACA) enrollment period. So while it is not possible to compare Americans' satisfaction levels before and after the law took effect, satisfaction has been largely stable since Gallup first measured it. Americans' satisfaction appears to be influenced by the nature of their health plans, particularly how much they have to contribute to the cost. As a result, those whose plans are subsidized by the government -- including military/veteran health plans, Medicare and Medicaid -- are the most likely to be satisfied. Those who receive health insurance through a union are slightly more likely to be satisfied than those who receive it through an employer, while those who pay for their own plan are the least satisfied of those who have some type of insurance. This last group includes Americans who purchased their own health insurance through the exchanges set up as part of the ACA. Their lower satisfaction may result from higher deductibles and co-pays for the most common "Silver" ACA insurance plans than for employer-sponsored insurance plans. But even with these differences, no less than 65% in any of these groups are satisfied. 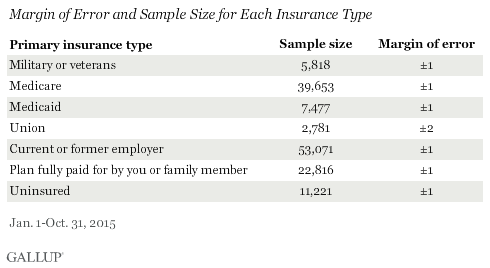 Only among the uninsured are a majority not satisfied. The higher satisfaction of military/veterans and Medicare recipients could also be explained by age patterns. Older Americans, who are more likely to have these plans, are more satisfied with the way the healthcare system works for them, regardless of the type of insurance they have. In contrast, the majority of those younger than 65 are on employer plans. Employer plans vary widely, with some employers paying much of the tab, while others pass the costs on to employees. Americans who get their health insurance through government-sponsored or assisted plans, such as Medicare and Medicaid or veterans insurance, are more likely to be satisfied with the way the healthcare system is working for them than those who have employer-paid insurance or who pay for insurance themselves. There may be a number of reasons for this, such as government plans being more inclusive and having a lower direct cost to the insured person than employer plans or personally paid-for plans. Additionally, the question asks about healthcare generally, and not cost specifically. Therefore, other aspects of the government plans such as access to more specialists, the availability of different services or ease of scheduling appointments may also factor into the higher satisfaction levels. Results are based on telephone interviews conducted Jan. 1-Oct. 31, 2015, as part of Gallup Daily tracking, with a random sample of 147,517 adults, aged 18 and older, living in all 50 U.S. states and the District of Columbia. For results based on the total sample of national adults, the margin of sampling error is ±1 percentage point at the 95% confidence level. Through the first half of 2015, Arkansas and Kentucky continue to lead all states in declines in the rate of the uninsured. Oregon, Rhode Island and Washington also have exceeded a 10-percentage-point drop since 2013. Americans' satisfaction with the way the government handles healthcare is up sharply from 2013. Overall, Americans are most satisfied with the government's mail delivery and least satisfied with its efforts to handle poverty.